Nutritional Immunology advocates the use of nutrients found in whole plant foods to support the immune system. The wholefood products we create are made from the highest quality ingredients, use the best manufacturing processes available, and are held to the strictest quality standards. Our dedicated team of scientists and researchers carefully research each formulation including our Signature Beverages that exemplify the quality we strive for at E. EXCEL. E. EXCEL’s newest improvement to our Signature Products line houses our most popular drink in revolutionary packaging. Now you can find Millennium and Millennium Red in convenient 6.8 fluid ounce cartons. By packaging award winning Millennium in these cartons, we have guaranteed freshness and convenience. You’ll only need to open one carton at a time and can take some of your favorite product to the office, school, or when traveling. With two options to choose from, you won’t have any problem finding the Millennium that’s right for you and your family. Millennium combines prickly pear cactus with royal jelly and honey. In 1996, our revolutionary Millennium formulation won first place at the Conference of World Traditional Medicine. Made from hand-picked cactus, cold pressed, and filtered to remove irritating components, it is carefully packaged into convenient, patented, state-of-the-art EP-PAK cartons to preserve freshness. Packed full of supportive compounds and phytochemicals, make Millennium your daily approach to overall good health. Made with the same fine cactus liquid, but without honey or royal jelly, Millennium Red is for those with low-sugar dietary needs or allergies to bee products. Natural orange and lemon provide a satisfying flavor for this delicious beverage. Our Millennium Powdered Beverage makes it easy to pack for traveling; convenient and safe. Take it with you anytime, anywhere! Made with stevia, a plant-based, non-caloric sweetener, instead of honey, this beverage is suitable for anyone, even those on low-calorie diets or allergic to bees. 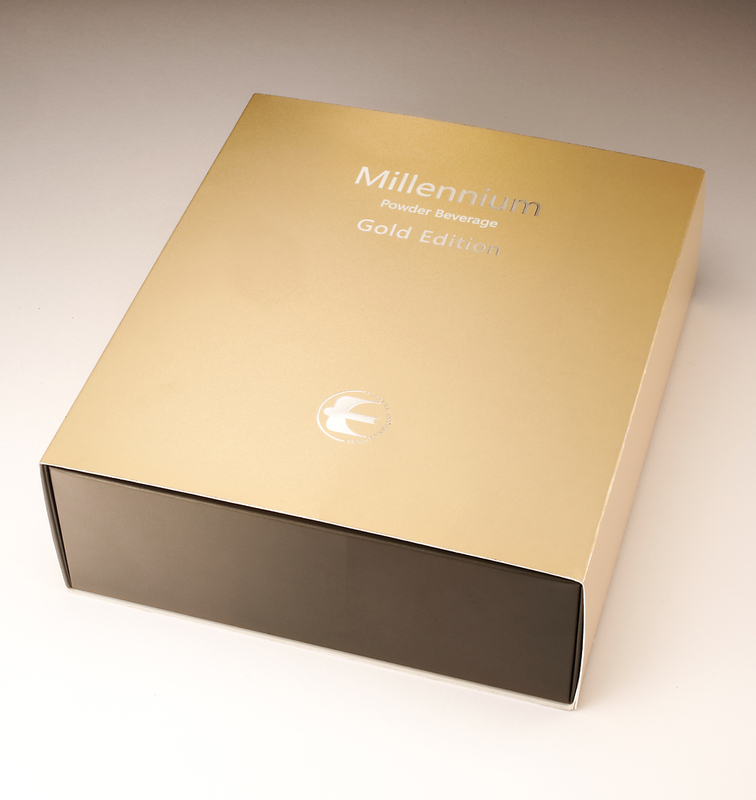 Millennium Powdered Beverage Gold Edition includes the high-quality cactus that all of our Millennium beverages contain, and is a low-calorie beverage, sweetened with stevia. Cordyceps mycelium, the fungal body that produces the fruiting body (cordyceps mushroom), is also included! Cordyceps may contribute to healthy immune system functions. Celebration includes high-quality cactus, cordyceps mycelium (the fungal body that produces the fruting body (cordyceps mushroom)), and American gingseng. Celebration is sweetened with natural stevia and helps support your immune system.